Introduction: In this post I try to explain how we can upload a new website and its files etc. via FTP. After completion of download install it. After the installation double click on FileZilla icon and FileZilla will be open as you can see attached snapshot. 2. Enter your FTP detail i.e. Hostname, Username and Password as mention in attached snapshot below with red mark. After that click on connect button. You see the root will be open of website as mention below in snapshot. 3. 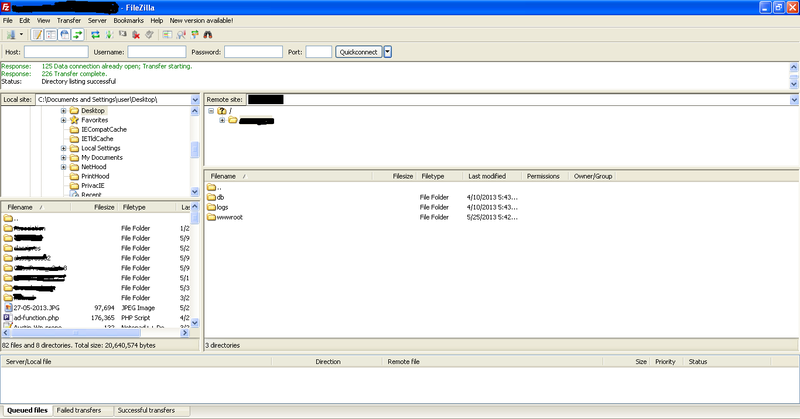 Double click on wwwroot folder. Now you will be see all folder and forms of website will be open see the attached snapshot. 4. To upload file Drag the file that you want to upload and drop on folder in which you want to upload. If you want to upload webform in public/user interface area than drop file in wwwroot folder or on webform that you want to replace. If you want to upload file in admin section than drop it in admin folder, similarly want to upload images than drop images in images folder. Note: please make sure firstly take the back of file that you want to replace. 5. To take back up of file right click on file that you want to download as mention below attached snapshot. To give location to download file see the below attached snapshot highlight with red color.